the BEST Pumpkin Bars with NUTELLA Cream Cheese Frosting! 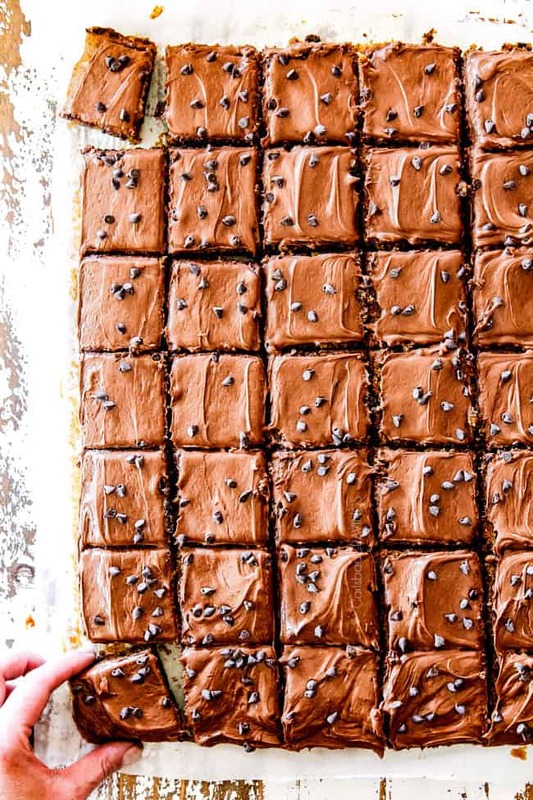 The BEST Pumpkin Bars slathered in Nutella Cream Cheese Frosting are easy, soft, tender, exploding with flavor and will have everyone singing your praises all season long! 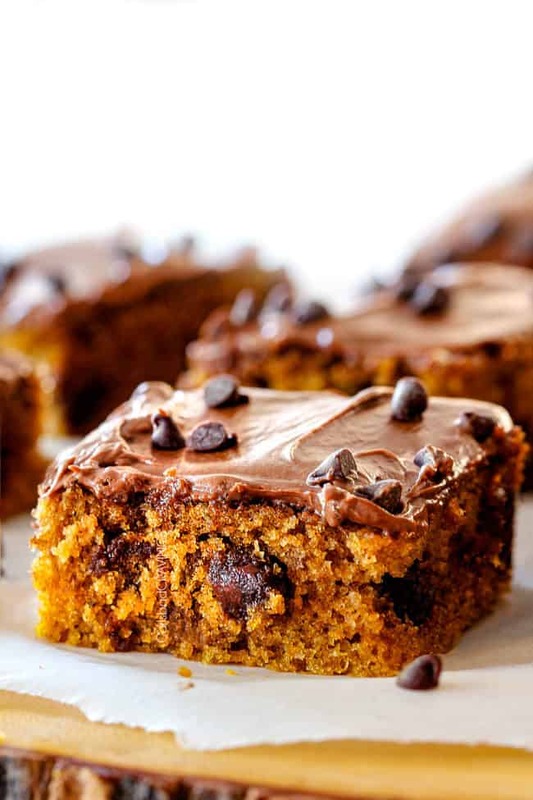 These Pumpkin Bars are the only pumpkin recipe you need this Fall! 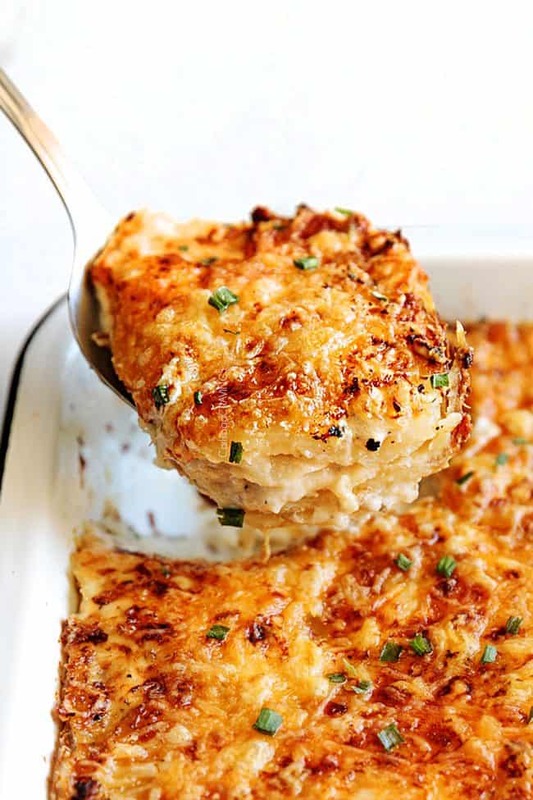 They are super easy made with one bowl and one sheet pan and ridiculously delicious! The Nutella Cream Cheese Frosting elevates them to beyond any pumpkin bar recipe you’ve ever tasted before! September 22 is the first day of Fall which means everything pumpkin! In anticipation of that blessed day, I’m wetting your palate with these Pumpkin Bars with Nutella Cream Cheese Frosting. I am salivating just thinking about them. 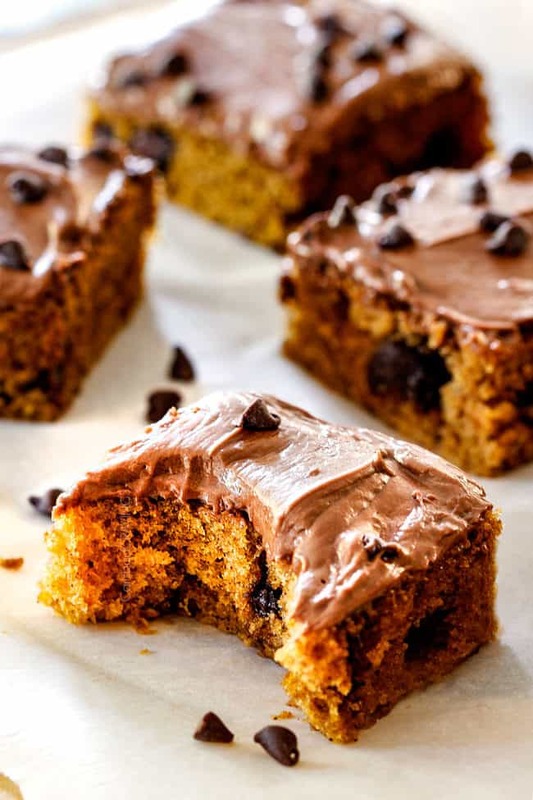 These Pumpkin Bars might be favorite pumpkin anything to date. They are super moist, rich, fluffy and the Nutella Cream Cheese Frosting is pure creamy decadence. But you don’t have to take my word for it. The day I made these Pumpkin Bars, my friends were having a church youth activity so I asked if they wanted the bars. “Those pumpkin bars were seriously unreal. 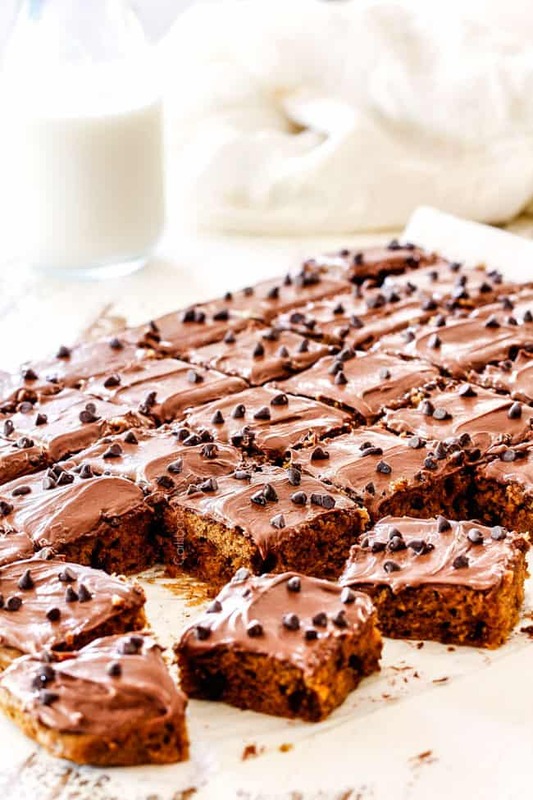 And the girls would not stop talking about how good they were.” Jen G.
Well, the good thing is, you can all “cook like me” and devour these ‘incredible” bars with my Pumpkin Bar recipe! This Pumpkin Pie Bar recipe is modified from my mom’s famous Pumpkin Bread and the Nutella Cream Cheese Frosting idea comes from my Pumpkin Crepes with Nutella Filling because pumpkin + chocolate = exponentially more delicious! So if you’re looking for the best homemade pumpkin bar recipe from scratch – look no further! 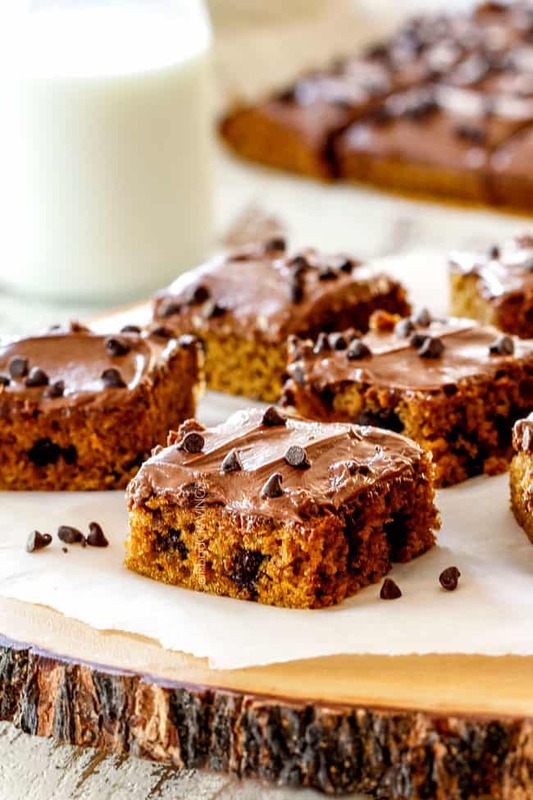 At first glance, the ingredient list for this Pumpkin Bars recipe might seem lengthy, but the recipe is very simple and takes less than 10 minutes to make, so bake on! Below please find how to make the Pumpkin Bars with Tips and Tricks in bullet points. 1. Preheat the oven and line a 12 x 17 baking sheet with sides (jelly roll pan) with parchment paper. Alternative you can butter and flour your pan but I find the parchment paper so much easier. By using parchment paper, you can also lift your bars out of the pan when they’re done. Room temperature eggs: It is essential that you use room temperature eggs for fluffy bars. Room temperature eggs whisk to a higher volume because the egg whites and yolks whisk together more easily. This promotes more even distribution into the batter resulting in light, fluffy cake (because eggs trap air). Cold eggs result in a more dense cake. 3. Sift the Dry Ingredients into the Wet Ingredients. 4. 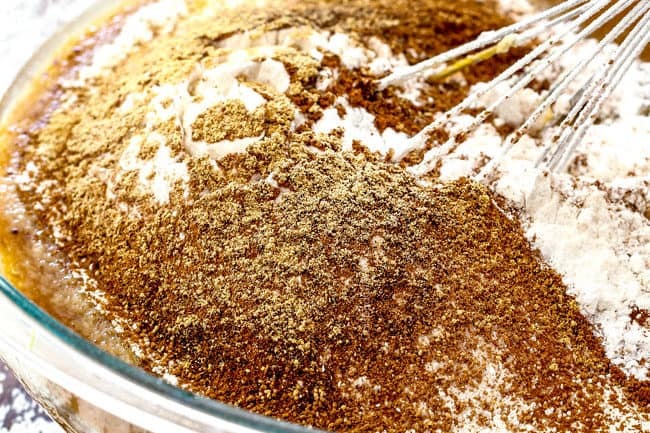 Mix the wet and dry ingredients together just until combined, taking care not to overmix. Stir in chocolate chips just until combined. Never overmix batter and stop mixing as soon as you see the white disappear. 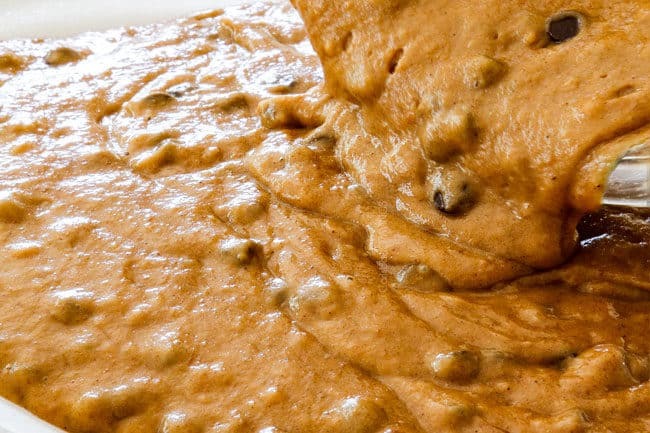 Overmixing cake batter causes the gluten in the flour to from elastic gluten strands which result in a dense, chewy texture. 5. 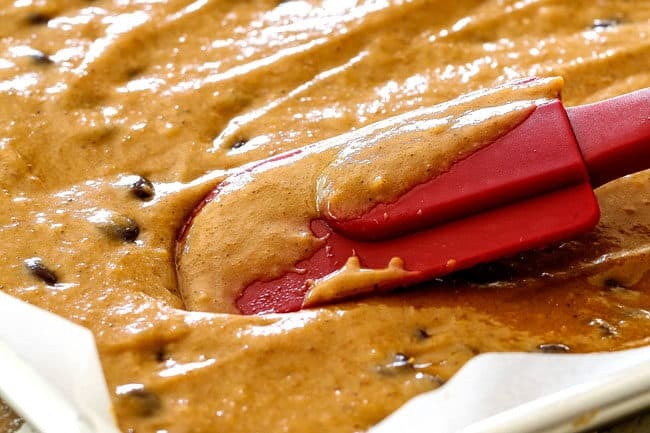 Spread the Pumpkin Bar batter into your prepared pan and bake for for 20-25 minutes at 350 degrees F.
If you don’t have a 12 x 17 pan, then other sizes will also work, just take care to adjust the cooking time accordingly and be aware you will end up with thinner or thicker bars depending on your pan size. This will also affect the frosting to Pumpkin Bar ratio. 6. Let Pumpkin Bars cool completely before frosting. If you try and frost your bars right away, then the frosting will melt. 7. 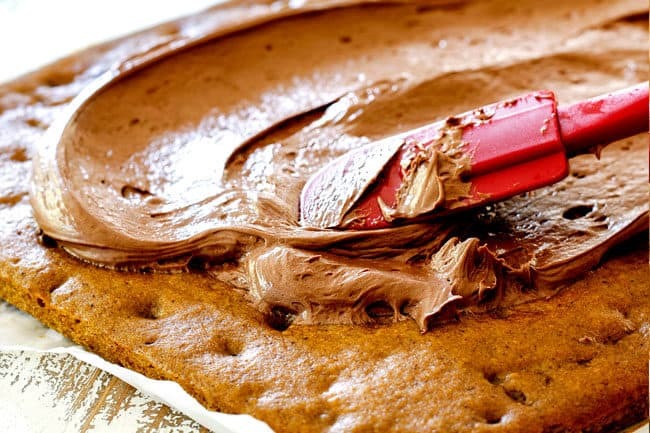 To make, Nutella Cream Cheese Frosting: Beat butter, sugar, cocoa powder and 2 tablespoons milk with handled mixer at medium-high speed until the mixture is smooth. Add cream cheese, 1 piece at a time, beating thoroughly after each addition. Add Nutella and vanilla and beat to combine. Add additional milk if needed to reach desired consistency. Evenly spread frosting over pumpkin bars. Do NOT microwave butter or cream cheese to soften for Cream Cheese frosting or it will be too runny. Let them both soften at room temperature. Cream Cheese Frosting is RICH, so don’t use all of it unless you want rich bars. (which we love and so did everyone else who devoured them). This is optional but you can decorate your Pumpkin Bars with mini chocolate chips, candy corns or candy pumpkins, etc. 9. Let the frosting set for at least 30 minutes. I tasted my bars right after frosting and then tasted them 3 hours later and they were WAY better because the frosting had set and the bar flavors developed. They are also much easier to slice. 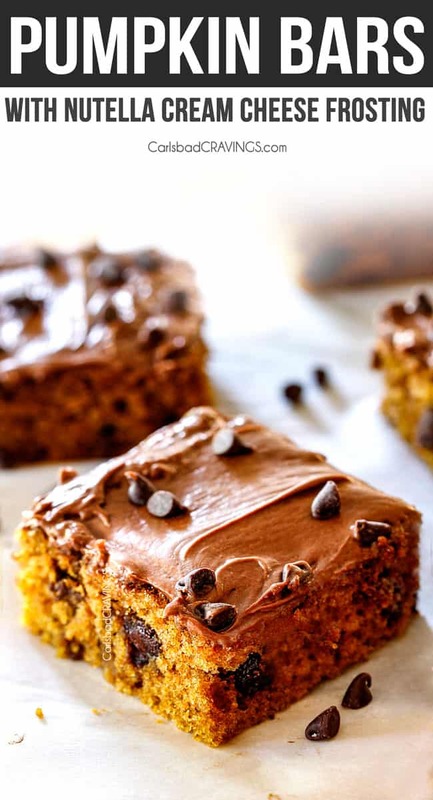 Want to try this Pumpkin Bar Recipe? Preheat the oven to 350 degrees F. Line a 12 x 17 jell roll pan with parchment paper and lightly spray with nonstick cooking spray. 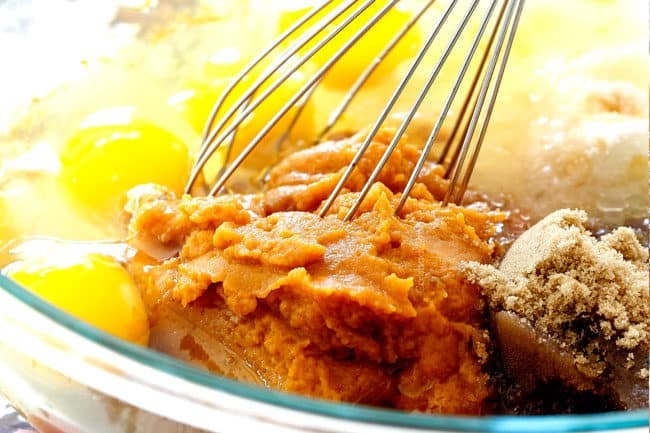 In a large bowl, whisk together all of the Wet ingredients. 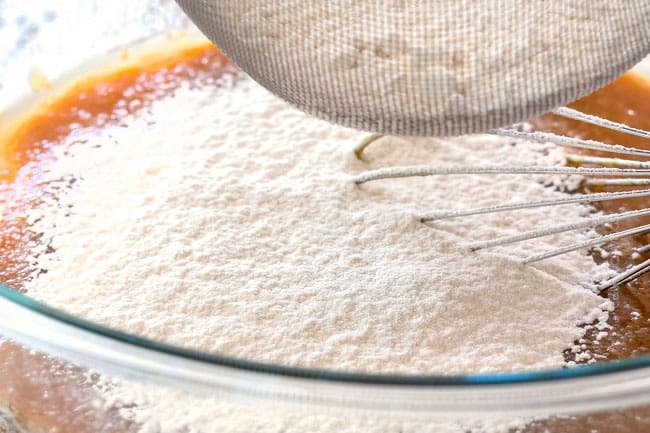 Sift in Dry Ingredients into the Wet Ingredients and mix just until combined - don’t overmix. Stir in chocolate chips just until combined. Spread the batter into prepared pan and bake for 20-25 minutes at 350 degrees F. Let cool completely before frosting. Beat butter, sugar, cocoa powder and 2 tablespoons milk with handled mixer at medium-high speed until the mixture is smooth. Add cream cheese, 1 piece at a time, beating thoroughly after each addition. Add Nutella and vanilla and beat to combine. Add additional milk if needed to reach desired consistency. Evenly spread frosting over COOLED pumpkin bars. Garnish with mini chocolate chips, candy corns, etc. if desired (optional). Bars are best if frosting is allowed to set for at least 30 minutes. Store in an airtight container. You can butter and flour your pan but I find the parchment paper so much easier. By using parchment paper, you can also lift your bars out of the pan when they're done. Sifting the flour not only evenly distributes the ingredients but results in much fluffier Pumpkin Bars. Alternatively, you can whisk together all the Dry Ingredients in a separate bowl then stir them into the Wet Ingredients, but the bars won’t be quite as fluffy. Pan Sizes. If you don't have a 12 x 17 pan, then other sizes will also work, just take care to adjust the cooking time accordingly and be aware you will end up with thinner or thicker bars depending on your pan size. This will also affect the frosting to Pumpkin Bar ratio. 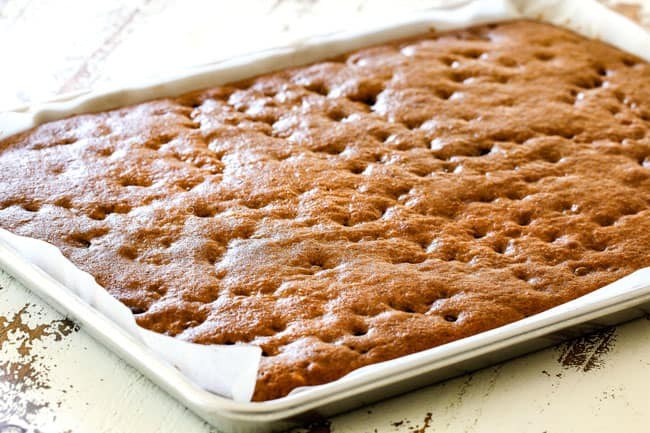 Let Pumpkin Bars cool completely before frosting because if you try and frost your bars right away, then the frosting will melt. **Do NOT microwave butter or cream cheese to soften for Cream Cheese frosting or it will be too runny. Let them both soften at room temperature. 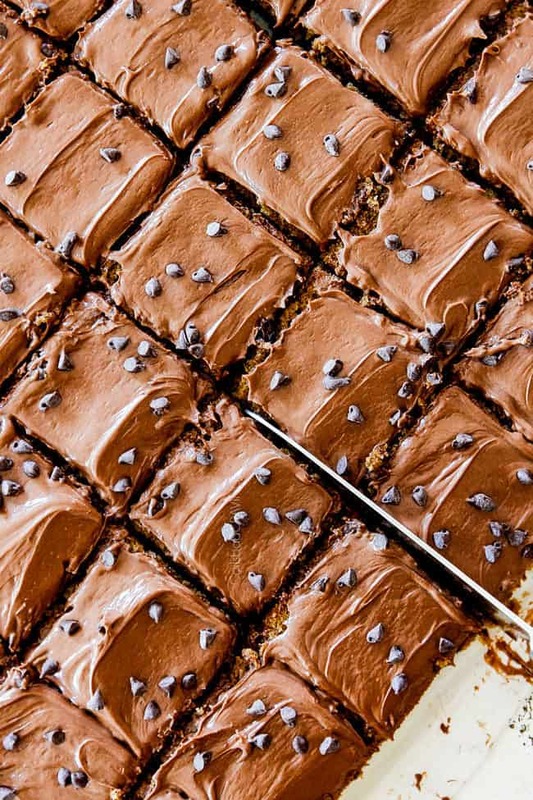 Nutella Cream Cheese Frosting is RICH, so don’t use all of it unless you want rich bars. (which we love and so did everyone else who devoured them). Let the frosting set for at least 30 minutes. I tasted my bars right after frosting and then tasted them 3 hours later and they were WAY better because the frosting had set and the bar flavors developed. They are also much easier to slice. These look phenomenal Jen! I’m going to make these for a party this weekend and i know they will be a hit. Thank you for all your amazing recipes! Thank you so much Cari, I promise they taste as good as they look! Hi Jen, I love your pumpkin bread, it’s the first Fall recipe I make every year but that might have to change because these look amazing! Hi Jamie, I’m so happy you love the pumpkin bread and that it’s become a Fall tradition! I’m excited so excited for you to try these Pumpkin Bars too – I can’t wait to hear which you like better! You are so welcome! I am so happy you’re making them so soon. I hope you love them as much as us! Move over Betty Crocker and Martha Stewart…Jen has arrived! And boy are her recipes the most amazing! You totally made my day Cheryl, THANK YOU! I am honored and flattered by your kind words! Thank you for following along and for making my recipes! I made this recipe and used a bundt pan to bake as a cake. 350 for 50 minutes. It was delicious! I frosted the cake with the amazing Nutella icing. That sounds amazing! I love the idea of making it into a bundt cake with the nutella frosting – yum! I’m so happy it was a hit! Jen! I just finished making 2 pans of these AMAZING, SCRUMPTIOUS, FLUFFY and EASYYYYYY bars! 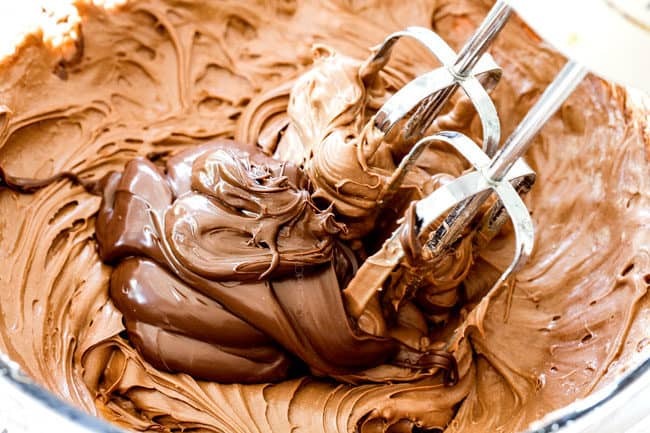 Nutella icing! You nailed this, and just in time for fall. Thank you for your creatively inspiring recipes. I can’t wait to take plates of these to friends….. Thank you for such a delicious pumpkin bar recipe. My daughter has celiac disease and this recipe was so easy to make gluten free and it was absolutely delicious! Two of her favorite things, pumpkin and nutella! Thanks again! That is awesome, I’m so happy she can enjoy two of her favorites! Thanks Angie!